Mud Terrain T/A KM2 not afraid of challenges! Designed for wetland crossings, built to overcome every obstacle off-road. 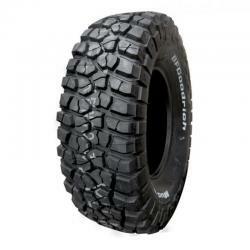 With better performance and a more aggressive appearance, this extremely durable tire delivers real enthusiasts wilderness experience, which is not sceneries so far. 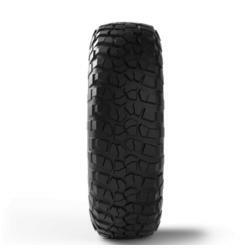 Stronger construction carcass cords on the sides for a clear increase in strength, durable side tyres can easily complete the off-road escapades. Aggressive shoulder pads that occur on the sides, an additional layer of rubber on the sides helps to protect the design of the tyres against damage on the Rocky wilderness of massive shoulder pads increase adhesion particularly at crossings with reduced pressure to increase the amount of attacking edge and better protection of the side of the rubber compound of the sides with a special component for improving resistance to cuts and break out designed for high resistance to sharp or rough rocks and other aggressive off-road conditions chamfered tread blocks improve stability and ensure even wear.